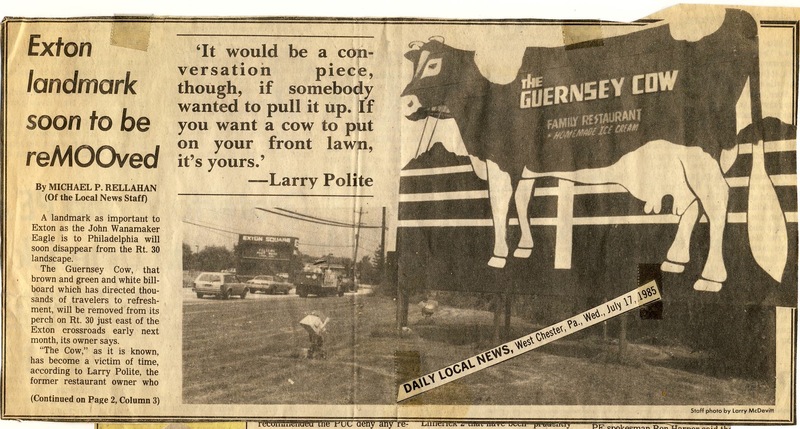 This past weekend, The Daily Local News published an article about an ad hoc committee formed in West Whiteland Township to discuss what to do with the remnants of the The Guernsey Cow sign that was dismantled in 1985 and how best to remember The Cow (I am a member of the committee). Part of that committee’s efforts is attempting to find the head of the Cow that was stolen in the middle of the night Tuesday, July 23, 1985. 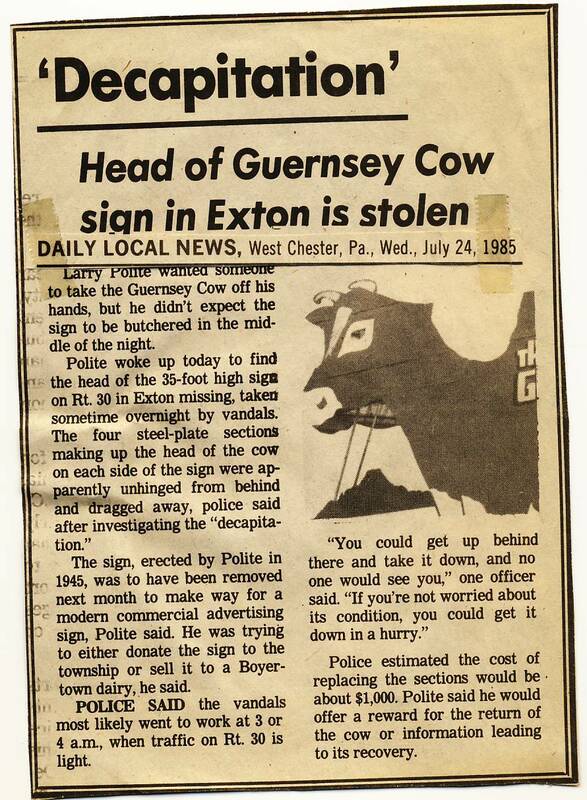 As mentioned a few years ago here, the bovine billboard that stood watch over the Exton, PA crossroads for 40 years was being removed in the summer of 1985 since The Guernsey Cow business had closed and the sign was starting to rot and fade. On Wednesday, July 17, 1985, The Daily Local News published an article (written by Michael Rellahan, the same author of Sunday’s article) about the signs impending removal. In a quote from the article about the Cow coming down, my grandfather said, “It would be a conversation piece, though, if somebody wanted to pull it up. If you want a cow to put on your front lawn, it’s yours.” Within a week, someone took his offer litterally. At some point between dusk July 23, 1985 and dawn July 24, 1985, the head of the cow was stolen. As the billboard was two-sided, there were actually two heads stolen that evening consisting of light but floppy and unwieldy large panels of sheet metal. As the article mentions, it’s suspected that the team was able to accomplish the mission in the wee hours when traffic was light. Almost 30 years later, personally, the story of the theft, more than vengeance or the pursuit of justice, is what drives my desire to track down the heads and the current owner(s). I’d love to hear the story behind the scenes. Were these teenagers that, on a spur-of-the-moment challenge, dared each other to a daring middle-of-the-night raid? Were these West Chester State College kids stuck in town for the summer in need of fraternity house decorations? I’d also love to see the head and where it rests, whether in a local field, overgrown with weeds, or in some former teenager’s — now middle-ager’s — basement. Later in 1985, my grandfather donated the remaining portions of the billboard to West Whiteland Township since they had expressed such interest in preserving it and using it in a public space. Since then, the billboard, minus its head, has sat in storage, in pieces, paint flaking while the township has occasionally talked of what to do with it but never gotten far beyond the talk. Now they’re talking again. It would be nice to see something done for real that would be some sort of testament to what The Cow meant to the community all those decades, whether it’s small or as larges as a 35-foot-tall Guernsey Cow. It would be nice to do that with at least one of the heads or the story behind their disappearance. If you know someone or heard about a guy who knows a guy who knows who took the sign, help us connect the dots. The statute of limitations is up on this incident so it’s more for the story now than anything else. Let’s solve this cold case! Email me at busboy at theguernseycow.com — your information will be treated with the utmost confidence!